Last edited by kitenaked on Thu Jun 27, 2013 3:17 pm, edited 2 times in total. Who's bringing the stripper pole?! So many options, you can't go wrong! Wish I was up there! d'ya get some night kiting in? 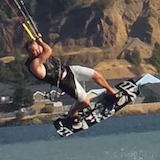 Come check out the latest kitesurf gear from Wainman Hawaii and Shinn as well as stand up paddle boards from Boardworks. July 20 & 21 - July 21st afternoon / evening we may be heading to Sherman Island for some moonlight sessions! Kite and Stand Up Paddle Downwinders from 12th Street to 1st Street! Cool refreshments & pizza on the evening of 20th! Come check out the goods this weekend. 12th to 1st Downwinders. SUP & Kite!!! Things are looking good for this weekend! SUP & Kite downwinders. From 12th to 1st Street. Pizza in the evening at the shop as well as cool refreshments! Free drop off and pick up this weekend for kite downwinders from 12th-1st street.